The Skewed Star is a star form of the well known "Diagonal Star". It's a member of The Magic Crystals family which means that it's parts can be used in combination with pieces from any other family member. 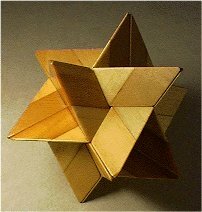 The Skewed Star has a hollow cube shaped cavity inside of it, so to some extent it's a Box Puzzle. Within The Magic Crystals it belongs to a special group of star-like rhombic dodecahedrons. 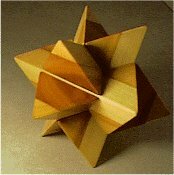 There are two variations of parts forming the Skewed Star. They have different dissection lines but together can produce the same shape.